It had been expected to go for up to $300,000, but a Bible inscribed by Einstein failed to find a buyer when it was put up for auction at Sotheby’s on Friday. The Bible was up for auction at Sotheby’s New York City auction house on Friday as part of a sale of rare books and manuscripts. Although there were no takers for the Bible, a letter by Einstein in which he shares his thoughts on the holy book’s religious significance is to go under the hammer on Tuesday. 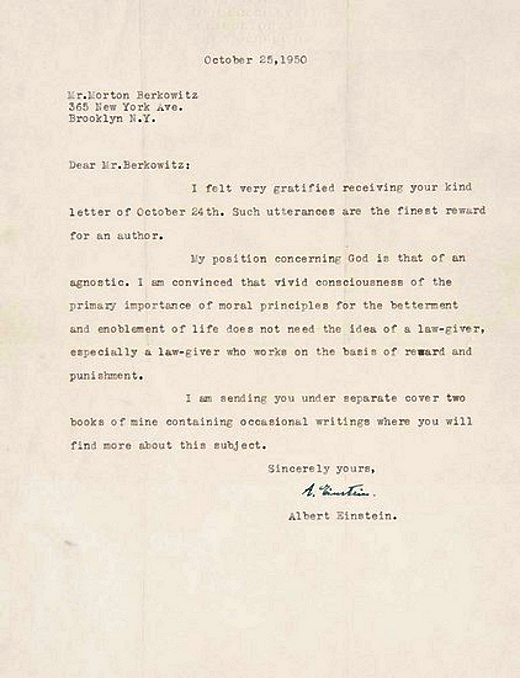 The letter is dated to 1954 – the year before his death – and reveals Einstein’s doubts about God and the authority of the Bible. ‘The word God is for me nothing more than the expression and product of human weaknesses, the Bible a collection of honorable but still primitive legends,’ he writes. The letter is expected to sell for $1.5m when it is auctioned at Christie’s in New York City. Although Einstein was a Jew, his views on God and religion continue to be a matter of debate. In one letter written in 1936, he expressed an openness to the possibility of a higher power, saying that ‘everyone who is seriously involved in the pursuit of science becomes convinced that some spirit is manifest in the laws of the universe, one that is vastly superior to that of man’. In a letter in 1950, however, he described himself as agnostic. ‘My position concerning God is that of an agnostic,’ he said.